Victoria Derby runner-up Bondeiger will open his Australian Guineas campaign in Saturday’s Autumn Stakes at Caulfield. Danny O’Brien brought forward by one week Bondeiger’s first-up run, closely following the path taken last year by Shamus Award. 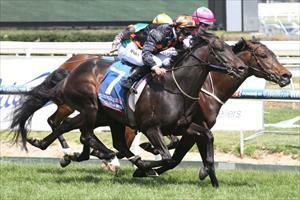 Shamus Award opened his autumn campaign in the C.F. Orr at the equivalent Caulfield meeting before progressing to win the Guineas. Bondeiger heads into the Group 2 Autumn Stakes on the back of a strong jumpout behind Chautauqua at Flemington last Friday. “We were always tossing up between the Autumn Stakes and the C.S. Hayes Stakes (Flemington, February 21)," O'Brien said. "Shamus Award ran on that day last year in the Orr and then went three weeks second up into the (Australian) Guineas,” O’Brien said. “We're just going to do the same thing with Bondeiger. The horse has come up really well. He looks great and has matured into a bigger, stronger colt. O’Brien said Prompt Return, beaten favourite when fifth behind Thurlow in the Chairman’s Stakes at Sportingbet Park on Saturday, had pulled up “reasonably jarry”. He said if Prompt Return were to progress it would likely be in the Talindert Stakes at Flemington, the track where he won the Maribyrnong Plate, on Black Caviar Lightning Stakes day — February 21.